This Nanna ash wood contemporary table or desk lamp finished in matt grey is on-trend, stylish and practical. 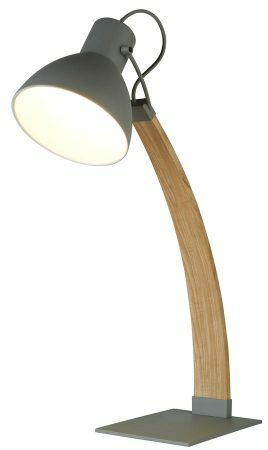 Combining the best of both worlds, this sturdy lamp features a flat base in grey, with curved flat profile ash wood stem and domed hinge adjustable head. Fitted with a convenient inline cable switch and class 2 double insulated, no earth required. This charming arc table lamp is the understated and effortlessly chic addition your home needs. The natural ash wood brings a rustic feel which contrasts against the stylish matt grey head and base. Perfect for use as a reading lamp position on a desk, study area or living room table. The use of natural wood, metal and matt grey combine to make a stylish and unobtrusive desk lamp that is bright and functional. The use of different materials and the graceful curve make it suitable for contemporary spaces, whilst the classic finish enables it to be used in traditional settings too. There is a matching floor lamp available; please see below and also available finished in matt black with dark ash wood. This table light is supplied by Searchlight who manufacture some of the best traditional and modern classic designs such as the Nanna ash wood contemporary table or desk lamp finished in matt grey you see here.